Warmer weather means it’s time to celebrate! While hosting a party can be fun and rewarding, it can also feel like more work and stress than it’s worth. A big problem with preparing your home for a party is all the clutter. Where do your everyday objects go? Here are some tips and tricks to get your home looking its best before a big party! While you may be tempted to shove everything into a closet and deal with it later, don’t! Storing items you want out of sight during the party in boxes and labelling everything clearly makes for less of a headache after the party. Whether you’re storing things in a specific room, a closet, the attic or a storage unit, make sure everything is organized, labelled and stored tidily. You’ll thank yourself for it later! Of course you want your home looking spick and span before having company over. Start cleaning early to ensure it doesn’t become stressful at the last-minute. You may want to consider hiring a professional cleaning service if you don’t think you’ll have time to clean before the party. You may have grand ideas for how you want your home to look, but they’re not always practical. Instead, make a decorating plan that is simple, while still making your place look great. A fresh coat of paint can go a long way to brightening up a room. Rearranging furniture or putting some away into storage can also make a big difference. Whether you want to keep it simple and elegant or fun and over the top, choose a design theme in order to help yourself organize and decide on things like decorations, colour schemes and menus. Take into account accessibility issues. 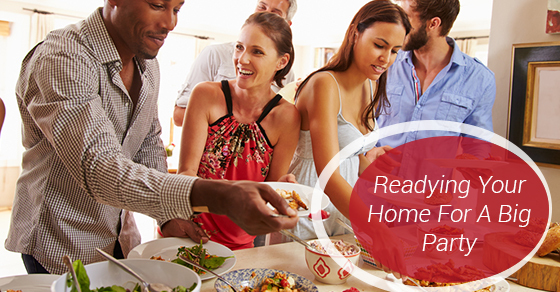 Make sure you prepare your home so that everyone feels comfortable and welcome. It is possible to rent short-term storage units where you can store any furniture or other household items you want out of the way. It’s the best way to keep things out of sight, and—with a secure unit—out of mind! Hosting a big party always means a lot of work! But hopefully with these tips, you can take some of the stress out of party preparation and clean-up and just enjoy your big night!